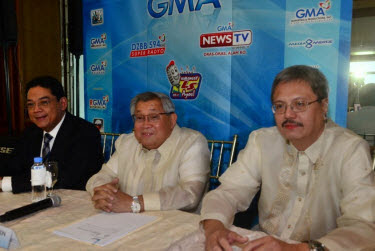 Broadcast company GMA Network, Inc. (GMA) boosted optimism for a financial rebound at the latter part of the first quarter 2012 after industry-wide advertising revenues tamed down in the preceding financial periods. In March, GMA’s top line surpassed the record made last year, even as consolidated revenues for the first three months dipped at a manageable level of four percent to P3.002 billion from 2011’s P3.138 billion. The Company’s net income reached P388 million, a strong start from the heels of a lukewarm closing in 2011, but failed to match or top last year’s P534 million. Television and radio airtime revenues wrapped up at P2.707 billion, while revenues from subscriptions, licensing, and subsidiaries came in at P295 million, higher by eight percent from last year. Core business unit GMA Channel 7 led the pack with more than 90 percent share of total airtime revenues; while Channel 11, carrying the country’s number one news channel GMA News TV (News TV) increased its revenue record by seven percent under the QTV format from a year ago. GMA Radio, meanwhile, maintained the same top line level versus the first quarter last year. GMA International contributed P231 million in the top line, slightly higher than the amount generated in the first quarter of last year, even with the appreciation of the Philippine peso against the US dollar, on the back of improved subscriber take up. GMA International managed a double-digit growth in subscriptions for GMA’s flagship international channel GMA Pinoy TV (GPTV), which has almost 303,000 subscribers or over two million viewers worldwide as of May 10. More than 117,000 of these subscribers also subscribe to the only Filipino lifestyle channel GMA Life TV (GLTV), which has one million viewers worldwide. Meanwhile, GMA News TV International is now seen in Australia, Canada, Guam, Japan, Madagascar, and the UAE. It will soon be available in Europe, Malaysia, and the US. GMA Worldwide, Inc. (GWI), the program acquisition and syndication arm of GMA, continues to penetrate Asian and US television (TV) markets thru distribution of Philippine-made programs dubbed in local vernaculars. The syndicated programs, which are seen either on free or pay TV, generated more than US$280,000 this quarter. The Company imposed financial discipline measures to maximize profitability for 2012’s opening period. Total operating expenses, which were programmed within budget, rose only by a low single digit to P2.046 billion from last year’s P1.989 billion amid higher production costs aligned with continued efforts to deliver superior programming and additional in-house produced programs in the News TV grid; and increased personnel costs resulting from expansion programs and modest take up in the Company’s manpower base. Bulk of the general and administrative expenses for the period came from higher depreciation rate with the operationalization of the state-of-the-art archiving software Media Asset Management System (MAMS). The Company’s earnings before interest, taxes, depreciation, and amortization (EBITDA) for the three-month period settled at P760 million, down by double digit year-on-year, but twice the EBITDA made from preceding quarter. The Company’s balance sheet, nevertheless, remained strong with debt-equity ratios at zero level. With a debt-free operation, GMA’s total equity stands at P10.216 billion as of first quarter 2012. On television, GMA maintains its nationwide household audience share margins over ABS-CBN that commenced at the opening of 2011. In April 2012, GMA led ABS-CBN by 6.1 household audience share points, equivalent to almost 1.1 million viewers in National Urban Television Audience Measurement (NUTAM), based on data provided by trusted ratings service provider Nielsen TV Audience Measurement. GMA also led TV5 by a solid 20.4-point household audience share margin in NUTAM, which translates to almost 3.6 million viewers nationwide in favor of GMA. The trending of audience shares for the three competing channels in the country’s key areas remains unaltered. GMA still keeps commanding double-digit leads over ABS-CBN and TV5 in Total Urban Luzon and Mega Manila, respectively comprising 77 percent and 59 percent of total urban television households nationwide. GMA was ahead of ABS-CBN in Total Urban Luzon by 13.8 points, which translate to 1.9 million viewers over ABS-CBN; and by 24.7 points or 3.4 million viewers over TV5. In its bailiwick Mega Manila, GMA was ahead of ABS-CBN by 16.2 points or 1.7 million viewers over ABS-CBN; and by 25.2 points or 2.7 million viewers over TV5. GMA’s lead is most pronounced in the morning and afternoon blocks, where it leads competitors across all areas by margins ranging from 10s to 30s. The Nielsen TV Audience Measurement used by GMA is also used by 21 other companies including TV5; Faulkner Media; CBN Asia; 15 advertising agencies and three regional clients. On the other hand, ABS-CBN is the only major local TV network reportedly subscribing to Kantar Media, formerly known as TNS. In Mega Manila alone, the Nielsen TV Audience Measurement has a sample size of 1,190 homes as compared to Kantar Media’s 770 homes. Nationwide, Nielsen has a total sample size of 2,000 homes compared to the lower sample size of 1,370 utilized by Kantar Media.